Adbikes of the UK has a line of four wheelers with high cargo areas that can carry a billboard ad. They also have a 4 wheel courier and load carrying model. Both models have electrical assistance as well as pedal power. Alternative Vehicles has a line of four wheelers and trikes mostly made by Pacific Cycles in Asia. Their 2 Rider model is a surrey-style bike but a little lower than most surreys, with two active pedaling positions and a kids seat adaptor or cargo area up front. It can tow a trailer. All wheels are suspended, and it has cup holders. Berg Toys of The Netherlands has four wheelers that look like pedaled go-karts, and tricycles as well, including one with an articulated front wheel for body-lean steering called the BalanzBike. They have off-road and street models, and four-seaters for the whole family. There are mud-guards to protect your arms from the rear wheels, and fully-enclosed chains for wet weather riding. They have US dealers listed on the US web site. Blackbird Designs has a system called the Quadribent that attaches two normal recumbent bikes to make a four wheel, side-by-side "Sociable Tandem" with independent gearing and pedaling. The recumbents can be detached for solo use. The company can provide doggy platforms and a rumble seat for kids. They also do some custom work for special needs riders. Bill Blakie - Very Eco has a quad designed by Bill Blakie of Invercargill, New Zealand. The bike is designed for mobility and has a sprung subframe under the seat, five speed gearbox that includes reverse, and front disk/rear coaster brakes. Body Cycles is an Australian company whose main line is "theraputic" trikes with a handle on the rear for a parent or assistant to help guide the rider. They also have a four wheeler constructed of two side-by-side linked bikes for those who can ride in normal biking posture. Brox HPVs in Manchester, England, has a four wheeler that comes in various configurations and is designed to carry cargo. The rider is in a recumbent position, with a large cargo bed behind, and the frame is articulated to keep all four wheels on the ground at all times. There is a flatbed, a cargo box and a child carrier model. They also have a "One Less Car" tricycle pedicab and other tricycle models. Caribbean Riders is a Florida-based designer, wholesaler and marketer of a line of surrey-style four wheelers. They have one model with a single bench seat and another with two seats. Both have the normal surrey top canopy. The Web site mentions drum brakes but does not mention gears. Carvx is a Dutch company with a four wheel mountain bike with four hydraulic brakes, full suspension and hub gearing. We could not find ordering or price info on the site, and the "news" page has items from 2003 and 2004, so it may never have made it into production. Chat 'n Bike in Gaithersburg, Maryland, is a US dealer for Dutch and Chinese four wheelers. They order batches of the two and four-seater Dutch Quattrocycles described below. They are also bringing in the Chinese GX01 four-seater. They arrange test rides. Ciclofan is an Italian company with an extensive line of four wheel surrey-style bikes. There are two, four and six seat models, with pedals for each rider, chainguards, drum brakes, mag wheels, lights and one with electric pedal assist. Weights run from 114 kg up to 270kg for the electric pedal-assist model, so even with gears and four-wheel brakes they are best suited for reasonably flat terrain like a theme park or boardwalk. Their German distributor says they are widely used in the rental industry. In the US they are distributed by Buena Vista (see surreybikes.com below) and also available from International Surrey Bike. ConferenceBike made by Velo Saliko of Germany, is a round seven-seat bike, with the riders facing each other, steered by the forward-facing rider in the back of the circle. All riders pedal, with seven independent freewheels. The photo gallery on the Web site shows the design well. You may have seen them at bicycle events. In the US, Larry Black of Mount Airy Bicycles in Maryland sometimes has one in stock. You can contact the manufacturer for other dealers. Contes Engineering has developed and will bring to market in 2012 an impressive four wheel machine that is intended for off-road riding and the kind of hard jumping that BMX riders do. It has long-travel four wheel suspension, a rear differential with two driven wheels and an upright rider position that is secure on jumps and permits using the legs to muscle the bike. Films (some on the Web site) are impressive when powered by Andy Contes, a former top-ranked pro BMX bike racer. It will be pricey, of course, but if you want something for off-road that has a chance of holding up well, this one is worth a look. They have a velocar in the works. e Quadz from Concept Cycles in Montana, has a four wheeler with or without electric assist and fat tires for back road cycling. The site has interesting info on their frame building techniques, as well as a detailed list of components. The model without electric assist is lighter and more of a road bike. Electric Bike Car Co has several models of their Ebikecar four wheelers that come as pedaled bikes or with electric motors. There are one, two and four seat models, with yellow seats, red frames and red or yellow 20" wheels. Adult and child models. There is a downward sloping accent over the e in Ebikecar, but we can't reproduce it. Eric has a four wheeled kiddie bike called the QQ-Bike that uses a rowing action to move forward and is steered by the feet. Colorful, with red, yellow and green plastic wheels perhaps 10" in diameter. For kids from 3 to 12 years old. The Web site won't work for us. Feetz of the Netherlands has a four wheeled cargo and child carrier bike. It is very upright and has 20 inch wheels. It has a box for the kids in the front and another box for cargo in the rear. They also have tadpole trikes with the front box only. The GrannyBike is a conversion kit for linking two solo bicycles into a side-by-side quad. The design includes crossmembers at the front and rear, plus a steering linkage that attaches to the handlebars of each bike. The company is in Ontario. Greenspeed now makes a quad called the Anura to complement its line of tricycles (see below). They use some off-the-shelf components and some components manufactured just for them. The Anura has an aluminum frame, a differential that drives both rear wheels, and front wheel steering geometry "designed so that when one front wheel leaves the ground, the other seamlessly takes over all the steering control." If you have ever ridden a quad down a bumpy hill you know why that would be interesting, and if you use a quad in snow the two wheel rear drive is a big plus. BentRider Online said it was very stable and "it was definitely one of the funnest machines on the test track." There is a kit to convert the Anura Trike to a fourwheeler. Gus Wheels is a Miami Beach company that makes four wheel bikes in a factory employing mentally challenged adults. The bikes are made of stainless steel to avoid beach rust. We can't find them on the Web. GX01 is a Chinese-manufactured four wheel, four person surrey bike. It is available in the US from Chat 'n Bike (above) who organize group buys. They have some interesting comments on usage limitations. Hoening is a German manufacturer with at least two four wheelers. One looks like a pair of solo bikes linked together and the other is apparently designed as a pedaled wheelchair. They make tandems and regular wheelchairs too. Hollywood Bike has a side by side tandem four wheeler that looks like it begins by linking two solos together like the ones from Blackbird Designs, Body Cycles or Grannybike but adds a wide seat across the two bikes and a surrey-like canopy top. Made in Thailand and sold from the inventor's Los Angeles office. Industrial Bicycles has a wide range of four wheelers, trikes and heavy duty industrial bicycles. They sell their own house bikes and many other brands as well. They have delivery vehicles, special needs vehicles, parts, accessories, electric drives, bike racks, car racks for delta and tadpole trikes, tools and a lot of other stuff. They say they have been in business since 1935. Worth a look for nearly anyone looking for a three or four wheeler. International Surrey Company is a large Texas company with many four wheel surrey models that are designed to withstand the rigors of the rental trade. Their typical surrey seats two to six adults in pairs, each with pedals, and has an awning on top. Some have a front bench for children, and the Surrey Limousine adds a rear seat as well. Electric assist is an option for any surrey, with an add-on fifth wheel in the rear. They also have a surrey trailer called the tram that carries two with pedals behind a regular surrey. They are the US distributor for the Italian Ciclofan surreys. Their advertising says they are the original surrey company in the US and have been "pedaling since 1970." Just Two Bikes of Hugo, Minnesota, has a system that combines two recumbents side-by-side. They can be separated for solo use. Karbyk of Italy has three basic models, all with aluminum frames, gears and many options amenities. Their machines are used in racing events like the British Pedal Car Racing Championship. They weigh about 55 pounds. An interesting Web site, but have your little yellow sticky note ready to cover the distracting moving gifs. In July of 2000 they emailed us that they are looking for US distributors. Kettler is a German manufacturer known in the US primarily for their aluminum bikes. They have at least three toy four-wheel models for kids, including one called the Street Hawk in the US market that is sold for as little as $70 at Toys R Us. All have small wheels, a fully enclosed chain guard and a coasting/freewheeling lever allowing the rider to disengage the chain for freewheeling action. Lightfoot Cycles of Conner, Montana, has several four wheel models, from cargo to lighter weight touring versions, with lots of options. They also make trikes, and models for people with leg or arm disabilities, very heavy riders, and other special needs or uses. They have a fully-enclosed velocar, as well as head-out models scheduled for mid-2012. Mayfair Bicycle Co of Indiana has a surrey-style four wheeler with a fringe on top around the canopy. They have one model, the Brighton, seating up to six adults and two children with four in pedaling positions. Mitraco/Maxwin of Taiwan has a four wheel Rickshaw model, with four seats with pedals and space for two kids, a canopy on top and caliper brakes. We can't find it anywhere on their Web page, but here is a photo they sent by email. Mobilette Ltd. is a Bulgarian company with an extensive line of four wheelers including two-seaters, four seaters and family models. Some models have pedals for all riders, and most have surrey tops. Many are intended for use at hotels and resorts. In the US they are distributed by Scooterbug. Mupocar by Belik Creation of Texas has three and four wheel versions of their "muscle powered car." They are all powered by cranks directly attached to the front wheels and pedaled directly without gearing. Front wheels are listed as 20 or 28 inch, so that's the fixed gear. The rear wheels vary by model and do the steering. The URL is not working as of June 2010. Nour has hand-made four wheel pedal cars for kids. The CEO, Tunisian engineer Mourad Feki, plans to produce an adult design as well. Pacific Cycles is a Taiwanese company producing a wide variety of four wheelers and trikes. They make unique vehicles, including many designed for handicapped riders. Some of their vehicles are available through Alternative Vehicles and a Canadian distributor, Belize Bikes. If you are searching for their products, avoid those of another company that uses exactly the same name except they have dropped the s on Cycles. Palm Imports has a four-wheeler similar in appearance to the Swiss ZEM, weighing 90kg. They have others as well, including surrey models. Palm is a wholesaler located in Florida. Pedal Back in Tyme is a Canadian manufacturer of 4 wheel bikes. They make an old-fashioned fourwheeler reminiscent of a Model T. Their Web link is no longer working for us, but we don't know what that means. Pedalcoupe has a compact-looking four wheeler that they say "speaks to the child in all of us." It is a serious bicycle with a serious price but has brightly colored wheels and other components. Both rear wheels are driven with a "posi-traction" system, and it has gears, high-pressure tires and an 8 foot turning radius. The company is in Minnesota, and has photos of their quad in the snow. Prime Pedal Karts is a manufacturer and importer of four and three wheel bikes for kids and on up. The designs look to be on the sturdy side. Some of their models have a reverse gear. They have interesting trailers, including one with four wheels. They are in Pensacola, Florida. QBX-Quad Bike Xcycles produces four wheel bikes in France. They have an aluminum-frame mountain bike with large suspension travel that is shown on the site grabbing some impressive air. They also have an urban model, and electric-assist is available on three hybrid models. Quadrabyke is a child's four, three or two wheeler. The small wheels can be set up in any of the three configurations. Quadracycle, Inc. of Hamilton, Indiana, has a line of four wheelers including a child's model, a single adult bike, a side-by-side double adult bike and a taxi that seats four with an awning. Quadracycle International of Saskatoon has a "Little Duece Coupe" for two adults plus a child. It is a three speed, and has at least two different carts you can add on to pull golf clubs or other cargo. Note the one letter difference in spelling between the companies above and below! Quadricycle International of Canada has a line of four wheelers described as "recreational vehicles with four wheels capable of carrying two to nine passengers. With a maximum speed of 8 km/h and being propelled by pedals, these vehicles are safe and in conformity with regulations regarding environmental concerns." Their Web page says they can be profitable rental vehicles. Quattrocycle of the Netherlands has a large four wheeler for four adults and 3 kids in the back that is more bicycle-like than most of the surrey bikes. Each of the four riders has a separate 3 speed gear hub so they can shift individually or freewheel to accommodate a range of pedal cadences. "The internal gear hubs and chains are the only part that is somewhat fragile. You must only switch gears when you are not pedaling." Front and rear axle suspension lets the bike negotiate obstacles, and there are four drum brakes. The front positions are more reclined, improving the view from the rear. The left rear position steers. The bike can be stored upright to save space. Designed to hold up under rental use, so it weighs 114 kilograms/250 lbs. There is an electric assist available. For a US group buy source, see Chat 'n Bike above. Rhoades Car is a long-time maker of one seat, two seat, and four seat four-wheeled bikes. The one I rode at Interbike rolled easily on a flat surface and seemed very stable, but at 90 pounds it would be slow on uphills and probably ideal on a boardwalk. In addition to their surrey-style and sport bikes, they have a collection of cargo bikes that can handle up to 700 lbs. Their Recycler carries four removable green recycling containers--that's about as green as you can get. The company has many options available including electric motors and solar power. They can do custom mods for special needs. The factory is in Tennessee, and 80% of their components are made in USA. Rideable Bicycle Replicas has quad surreys and trikes along with their boneshakers and highwheels. They also have a unique upright tandem trike, some hand-cranked trikes and tricycle pedicabs that can be outfitted with a two or four person trailer if your legs can handle that! They are in Southern California. Rowbike has a four wheeler called the Crewzer that is powered by a rowing action rather than pedaling. They are in Minnesota. Seat of the Pants Company (UK) had a line of utility quads configured as taxis and in a pickup truck style. We don't find them on the Web any more, but they still can be found as the producers of the famous Windcheetah tricycle, which in competition with a full fairing has done nearly 50 MPH on a flat road. SightSeeingBike, also known as Partyfiets in the Netherlands, and as Beerbike in the UK, has very large four wheel party bikes similar to the Fietscafe bikes above. There are up to 18 partiers sitting around a central table and most are pedaling. They use a car differential and drive shaft to link the pedalers. The site has interesting photo sequences of producing the machines that show the underlying frame. They are working on an amphibian as well. The Dutch parent company, RondjeRegio, will produce bikes for the US market in Bend, Oregon. SurreyBikes has several four wheelers that resemble old fashioned surreys. One has three rows of seats for up to nine adults. In the Service section there is a long list of component parts and some detailed schematic drawings with exploded views of their machines' components. They are a Buena Vista Disney company in Longwood, Florida. They are now the US distributor for the Italian brand Ciclofan (see above). Tecnoart of America has an Italian-made four wheeler called the Selene Sport (a 2-seater) and the four-seater Selene Bus and a six-seater as well. Check the Web page for details. 2-Rider is a four passenger (two pedaling in the rear) four wheeler made by Pacific Cycles. It's a surrey-type machine with a canopy, front and rear suspension and rim brakes, with the front brakes mounted on a J shaped bar that wraps around the wheels. Note that the original Pacific Cycles has an S on the end and the more recent Pacific Cycle of the US does not. Trailmate makes a four wheeler called the Double Joyrider with two side-by-side seats, 24" wheels on the back and smaller wheels on the front, independent pedaling and plastic bucket seats. In addition, the company makes several trikes for both recreational and industrial use. The trikes range from an upright Adult model to a Funcycle series for the sportier market and a Joyrider model designed for people with balance issues and other special needs. They are in Bradenton, Florida. Transport Cycling has pedicabs. Most are three wheeled, but they have one unique four wheeler with the driver in recumbent position. That should improve the forward view of the passengers. They also sell components and do custom work. They are located in San Francisco. TumTumCar is produced by JMC Motoronics, a California company. They have two models of four wheelers. Both can be pedal-powered, but one also has a 35cc recoil start gas motor. If you must have a four wheeler that burns fossil fuel, here it is. Both have front and rear independent suspension with springs and shock absorbers. 2-Rider is sold by the Austrian company Metallhase. It is a side-by-side two person machine that comes from the ZEM heritage. It is made by Pacific Cycles, and may be available from other dealers, but Metallhase believes they are the only dealer in Europe specializing in them. The ZEMs were nice, well built machines, on the heavy-duty side. Ulamo, a Dutch company, makes four wheeled go-cart-like pedal vehicles that sell in the Netherlands. We have not been able to find them on the Ulamo Web page, but you might contact Ulamo U.S.A., One Rockefeller Plaza, STE 1420, New York, NY 10020, phone (888) 449-3365. Van Dalen Products of the Netherlands has four wheel pedal cars for kids styled like an army jeep. They also make gas-powered jeep-style go-carts as well as swan boats and other pedal boats, and a car-sized gas-powered locomotive on tires that pulls a three car train. Very Eco is a New Zealand maker of what appears to be a practical and well finished four wheeler with a sprung sub-frame under the seat, disk brakes in front with a coaster brake in the rear, and a five speed gearbox including reverse. Voiturettes Velocar This French company has recumbent models including one, three and 21 speed versions. They are rated to carry 2 adults plus two kids and a baby in the front basket, with 1 double hydraulic disk brake, 2 driven wheels with a differential, a spare wheel, headlights, tailights, removable sun shade, pannier, chainguards and a 250 kg capacity. When we last checked in August of 2007 their Web page said "Nothing here yet. Come back later!" A Google search indicates that the name Velocar was used in the 1930's for a line of recumbents. Work-Bikes This Berlin company (Work Bikes Dumdei/Eilhauer GbR) has a unique four wheeler with a large rear sign for commercial advertising. The rider is semi-recumbent in the front with a front fairing, and it has disk wheels. The drive train is a design developed by AVD/Windcheetah. It rents for 228 Euros per day in Berlin. The site is in German, but here is an English translation. Work Cycles is a Dutch site with work tricycles, including unique delivery trikes, old fashioned ice cream trikes, and old fashioned Dutch street vending trike, and a larger industrial trike equipped for waste collection and cleanup. Worksman Cycles is a US manufacturer founded in 1898 and best known for their utility and cargo bikes, most of the tricycles. In addition to an extensive tricycle line with many variations, they distribute four wheel imports from Italy, the Sirenetta and Delphino Quadricycle Surreys. They are in Ozone Park, New York. ZEM - Zero Emmission Machine of Switzerland built a truly heavy-duty four seater. Complete with wide gearing and freewheeling pedals for each of the four riders, it weighs 70 kg, and can be fitted with an optional electric assist. They also made two-seaters, and planned to eventually have a sail version and a super light version. Unfortunately ZEM Cycles are out of production, but pre-owned vehicles are available. Larry Black of Mount Airy Bicycles in Maryland emailed us in November of 2007 that he had three Zemcycles in stock. And 2-Rider (above) has the two-person version. They are made by Pacific Cycles. Z-Rider is a four seater with two independent adult pedaling positions in the rear and two child passenger seats in front. It has 8 speeds. The four 20" wheels are independently suspended. The "main rider" who controls the shifting can be on either left or right. There is an optional plastic canopy on top. Available to dealers through Pacific Cycles of Taiwan. Pedicabs We have a few pedicab makers listed above and below in the trikes, but the International Bicycle Fund site has a listing of over 35 pedicab producers. Highly recommended if that's the machine you need. Wheel Fun Rentals has a service at resorts that rents seven different three and four wheel bikes. Might be a good place to try out a four wheeler, if they are near you. American Speedster has plans and kits for four-wheeled models, two for kids and two for adults. The kids' bikes are made of plywood or a 55 gallon plastic drum. The adult bikes are made of pvc pipe available at Home Depot. It is cheap, strong and easy to work with, requiring minimal skills and tools you already have. The kits have all the metal parts. If you are looking for an inexpensive fun bike for your beach house or vacation home this might be your solution. Atomic Zombie sells plans for a wide variety of four wheelers and trikes. Granny Bike makes a kit to put two standard 2-wheel bikes together to make a four wheeler. Prices start at about US$92 plus shipping, quoted in Canadian dollars. Ian's do it yourself bike car is a very nice site put up by Teo and Ian Spiller detailing how they built a four wheeler for Ian. The photos are excellent. Design is simple and uses many standard bike parts. Teo also has some links to other do-it-yourself fourwheel projects. Mark Norwood's MG-TC project is a site detailing in photos how Mark is building a scale model of the MG-TC sportscar for his kids. It seems to be progressing nicely. Stevenson Projects has plans for three wooden scale model four wheelers: Bugatti, MG-TC and a pedal biplane. The plans are $40. Teo Spiller has a page up on how he built a four wheel bike for his son, with enough room behind the seat to accommodte an adult. Bikecar Corporation will sell you plans for three different models. Their "pickup" model puts the cargo load behind the rear axle, so the more you load it the lighter the front wheels would be. That could make bumpy downhills a thrilling experience, but is probably fine for the beach. In December of 2000 we were informed that their current address is BIKECAR CORP, P.O. Box 72, Ocala, Florida 34478. A note from them said they were having trouble finding any more information sheets to send out, and also said, "our vehicle is Build It Yourself & you need to weld & have parts made in shop." They refer people who need a fully constructed vehicle to Rhoades Car (see above). Another possible source of plans, or used bikes for that matter, is Ebay, an auction site used by many to market goods as well as auction things. Be sure to check the box for "Search titles and descriptions." Mother Earth News has plans for an Irish Mail-style hand pump four wheeler. They used electrical conduit to keep it light and cheap, but you could also use something more durable. They have plans for a bike trailer. Just ignore the unprotected child passenger and lack of helmets! They have other human-powered vehicle plans as well if you can find them on the Web site. Michael Dallas did it himself, twice, learning from the first one and sending us a message about his second machine. Actionbent of Redmond, Washington, has one tadpole trike with 20 inch front wheels and a 26 inch rear drive wheel. Disk brakes, 27 speeds, bolted on front axle that should come off for shipping, weighs 37lbs., attractive price. Adventurer from CampingWorld is a folding delta trike (two wheels back, one front) that is sold in Recreational Vehicle (RV) stores and designed to fit in an RV or on a rack in back. Three speeds, reasonably priced. If you are looking for inexpensive and simple folders with two or three wheels you may find them at RV stores. Alternative Vehicles has a line of trikes and four wheelers mostly made by Pacific Cycles in Asia. Designed mostly for rehab and mobility, there are hand-powered models, a folding trike with small wheels, a very upright model and more. AngleTech Cycles has quite a line of recumbent bicycles and tricycles, tandem recumbents, and folding recumbent cycles, and women's cycles. They make a trike that has both arm and leg power, and offer to do custom stuff. They are located in Colorado. ASE Manufacturers is a Taiwan company with a line of pedaled and electric tricycles. They are the upright style used for deliveries and for riding in campgrounds and factories. Some have two wheels in front, some in back. In addition they have AseTek Special Needs Tricycles that have structures to help hold the rider upright and other adaptations. Their Web site was not responding the last time we checked. Au Coin du P�daleur in the Montreal area manufactures and sells trikes. Most are utilitarian delta or tadpole trikes designed with racks or cargo areas to carry things. But they also make special needs trikes and pedicabs. The store has been open for 40 years, and began making trikes 20 years ago. They have an extensive line, and many designs you don't see elsewhere. Belize Bicycle has a series of tricycles branded Tri-Rider with an upright position and cargo baskets in some models. They also have an electric trike. They are located in Quebec, and distribute to dealers in Canada and the US. Bella Bike of Denmark has an upright tadpole trike with a front box that carries from one to four kids, or can carry an ice cream box. It steers by the rear wheel and is powered by the front wheels, including a differential. Berkelbike is a combination of a handcycle and a recumbent bike and is driven by using both the power of the arms as well as legs. There are three models for those with spinal and other injuries. The best description is a wheelchair with a front wheel attachment that includes foot pedals and hand pedals. There is an indoor model, and all can be used with a laptop-based training program. Berkut Trikes of Romania has been in business and making trikes since 1986, including racers, fully faired races and velocars. Their current production is a line of tadpole recumbent trikes. Berserker Tricycle Design has a long travel full suspension recumbent tadpole tricycle intended for off road cycling. It has 24" wheels, with 6" rear suspension travel and 5" front suspension travel. There is an electric assist available. Big Cat Human Powered Vehicles has an aluminum frame tricycle weighing 33 lbs with disk brakes and 27 speeds. They have a helpful page listing their dealers in the US. Their factory is in Winter Garden, Florida. BiKe Bug is a Houston company that engineers and sells a wide variety of large cargo trikes. They have a foldaway model whose wheels and other parts all fit in the cargo box for storage. 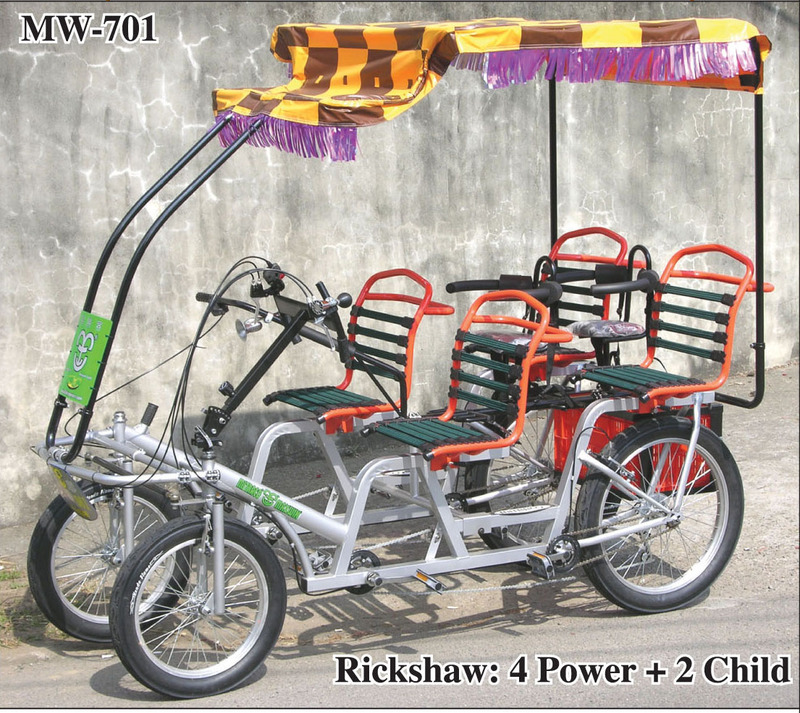 They also have a rickshaw design that they call their Buddy Bike. They sell gas motors and electric motors you can add on. They also have sidecars, a trailer and other merchandise. Body Cycles is an Australian company making "theraputic" trikes with a handle on the rear for a parent or assistant to help guide the rider. They also have a four wheeler constructed of two side-by-side linked bikes for those who can ride in normal biking posture. Their Edge line of chain-driven trikes have tire sizes starting at 12" and going up to 24 inches. Boomerbents has an electric assist trike called the Raptor with an upright seating position and two wheels in the rear equipped with a differential. They say the top speed is 15 mph on electric power, and range is 35 miles. They are in Las Vegas. Roger Bowden is a Canadian maker of tricycles and trailers, apparently mostly for himself and his family. He has explanations of his construction and plans up for some of them (see the plans section above). Cab-Bike is a German recumbent trike "velomobile" with an egg-shaped shell surrounding the rider. There is a fully-enclosed version and a trimmer "speedster" version with the rider's head emerging or covered with a small fairing. That one has managed 30 miles in an hour race. Comes with the 14 speed Rohloff transmission. Comes broken down, so considerable assembly is required. There is an electric motor option. Prototypes include a tandem and a solar-powered version. It looks like a hoot, but it is very expensive. We have not seen one, but it could be a great winter commuting vehicle. Here is a very thorough review posted on the Cab-Bike site. Christiania Bikes produces in Denmark a number of tricycle models, mostly with the rider behind a large cargo box. Some are designed for transporting children. Maximum loads are up to 100 kg. Comfort Cycle may still have their slick recumbent trike with 49 gears, Phil Wood hubs, and optional fairing. I managed to almost turn one over doing something flaky on a brief test ride, but that's a trike for you. Their link was not working when we last checked, and leads you to a magazine. Cycles Maximus has sturdy looking tricycles in pedicab/rickshaw taxi style, cargo style and flat bed cargo style with both pedaled and pedaled/electric options. Starting with the flat bed, you can interchange the cargo or pedicab body. They are based in the UK. Di Blasi is an Italian company with folding tricycles. They have 20 inch wheels, and a graphic on their UK Web site shows how they fold "in five seconds." They are not the only folding tricycle in the market, but are surely the only one with two independent v-brakes operating on the front wheel. There are good photos of the folder on Helen-Louise Windsor's site along with shots of her old Pashley. Di BlasiDirt King has mostly kids trikes, but one adult model that looks like a scaled up kid's trike called the Adult Dually. ETNNIC Bikes & Components of Spain has the ETTNIC line of trikes, including cargo trikes, electrics,off-road models and more. Their unique ETNNIC Garbi is a cargo trike fitted out to pick up trash in parks, with a trash can front end, upright broom holder, internal hub gearing and a trailer. eZee has the Carro, an electric or electric-assist trike with lithium polymer battery capable of 10 mph and 20 miles + per charge. Seating position is upright, and the frame is an easy stepover design with 20" wheels. There is a large basket over the rear wheels. Seven speeds for the pedaling part, or you can cruise on the electric motor. eZee has distributors in a number of countries. Die Fahrradwerkstatt is a German company with six models of tadpole-configured cargo trikes and a trailer. They include a child-carrier with a big platform box in front, a commercial vendor's stand on wheels, a big transporter, and a rickshaw. Most appear to have 16 inch front wheels and larger rear wheels. Some are clearly for heavy duty use. Feetz of the Netherlands has tadpole cargo and child carrying trikes with a front box that can carry either. It is very upright and has 20 inch wheels. They also have a four wheeled version, with a box for the kids in the front and another box for cargo in the rear. Although they appear designed for trundling around town at modest speeds, a video on the home page shows one zipping along and swerving to demonstrate that the wheels tilt into curves, so with some care for weight shifting at appropriate times they could be faster than they look. Fietscafe is a Dutch four wheeler for 16 happy passengers. The body is made of beautifully polished wood, and has a canopy overhead. The passengers face inward in party style, grouped around a center table to put their drinks on, and most of them have pedals. There is a large beer barrel in the rear, and the driver sits in front in the center. It looks like fun. If you live anywhere around Houston, Texas, you can rent one from Pedal Party. See below for the similar PartyFiets bikes. Flamingo is a Taiwanese brand from Grace Gallant Enterprises Co Ltd. We have only seen them once at Interbike and don't know where their trikes are available. They are recumbent tadpole style trikes with aluminum frames, 26 inch rear wheels, 20 inch front wheels, disk brakes and 27 speed gear trains. Fietsen Met Kinderen is a Dutch site with an incredible array of trikes and bikes that have child carriers in front. Although putting the child in front puts them in the way of the parent's body in a front end collision, some of these machines appear to have considerable structure for child protection. Frank Mobility Systems Inc has a unique Duet model "wheelchair bicycle tandem" that is in fact the back half of a bicycle attached to a wheelchair in front. The bike is a three speed and the wheelchair can be removed and used by itself. There is also a seven speed model with electric assist. Here is a description of how it is used in a medical therapy program. They are located in Pennsylvania. Freedom Concepts makes custom trikes for children and adults with disabilities, including a forward-leaning prone recumbent with chest support for people with cerebral palsy and a tandem controlled by the rear rider. Their head office is in Winnipeg. GigaTrike makes bare-bones trike frames to sell on Ebay. They use pieces from 4-6 old bikes, usually with a couple of 20 inch bikes and at least one 26 inch frame. These are combined with plumbing fittings and pipe. There are interesting photos on their site if you want to make a trike frame or are interested in a low-cost trike. Gomier Electric Trike is less expensive than some electrics. It is an upright position delta design with step-through frame and 8 mile+ crusing range at a maximum 8 mph. The pedaling is single speed, said to be suitable for flat areas. No company Web site, so the link is to a Google search for dealers. Greenspeed makes a nice line of tricycles. They use some off-the-shelf components and some components manufactured just for them. I enjoyed riding one at Interbike and found it very stable when I deliberately tried to tip it over with sharp turns and braking. They have tadpoles, delta trikes, six models of folding trikes, tandem trikes, a hand-powered trike, a quad and a velocar called the Glyde. In 2012 they added a Magnum Trike designed for heavy users, with a high seat for easy entry that can be adjusted downward if you lose weight from riding the trike. Users of their tandem trikes give them a high rating, and here is a review in BentRider Online that is positively ecstatic. If you can afford custom work, they have a custom shop. Handy is a hand-driven low-profile tadpole tricycle with high-profile handlebars. It has internal hub gearing on the front wheel and controls for shifting and braking built into the hand pedals. The Handy Upright version has a higher seating position. Both have 20" wheels. They are available to dealers from Pacific Cycles of Taiwan and are recommended for upper body exercise and people who can't pedal with their legs. You can read about Pacific Cycles in the March 1, 2006 issue of Bicycle Retailer and Industry News. The article explains why the original Pacific Cycles has an S on the end and Pacific Cycle of the US does not. Hase Spezialrader is a German company with a tricycle model they call the KettWiesel with dual rear wheels and one in front. Steering is by joysticks on both sides. You can make up a tandem by removing the front wheel of the rear machine and attaching it to the rear of the front one, resulting in a five wheel tandem. Hase also has a Lepus trike that folds. Hase has an arm powered model, and can set up their bikes for one-handed operation. They have an impressive array of accessories. Hean Cyklen is a Danish company with trikes for one and two people with and without electric or gasoline motors. Their vehicles appear to be aimed at those with disabilities. Hell-bent Cycle Works has designs for Thunderbolt Mk II 26 tadpole-style recumbent trikes with an aluminum frame. They sell trike plans and components when ready, and have some copyrighted plans on the Web. Be sure to check out the About page for background on how the company has developed and the What's New page for recent changes. The plans we have seen appear to be very well done, with photos, drawings and dimensional drawings along with discussion of frame materials and a lot of other info. We have not, however, built one, so we don't know how they work out. Hotmover is a New Zealand manufacturer with a three-wheel design that is different enough to tell you right away it is not US-made. Slick looking and nicely finished. They have dealers in the US and elsewhere, listed on their Web site, but can sell direct if you are too far from a dealer. HP Velotechnik is a German company with a Scorpion trike that comes in a unique folding version. In two minutes with a 6mm hex key it folds two ways and the wheels readily remove for a very compact bundle that fits in the trunk of a Smart microcar. The Web site has links to magazine reviews. Prices start at 2700 Euros (about $US 5,400). HPV has new models in 2010, including an "entry level" trike with a 20" rear wheel. Human Powered Machines has trikes available from the Eugene Bicycle Works in Eugene, Oregon. They have a recumbent work trike with a large rear platform that carries 333 US pounds and another that is rated at 666 pounds. There is also a long-wheelbase recumbent trike called the Tritan, and a tadpole-style called the Cyclone. Husky Bicycles has a balloon-tired "industrial" tricycle suitable for use in a manufacturing plant as well as cargo tricycles designed for vendors or for large volume cargo, maintenance, janitorial use and luggage carrying at hotels or resorts. Their trikes are made in Mexico and marketed by a Texas partner. Ice Trikes are produced by the UK's Inspired Cycle Engineering. They are suspended tadpole trikes with a choice of longer, more laid back seating position or a more upright position with a much shorter wheelbase. International Surrey Company is a Texas company with one recumbent Impello delta trike for two people side-by-side, built with a tub-like body on a steel chassis and seven speed gears. They also have an "easy rider" style electric delta tricycle for one person. It has a maximum speed of 12 mph+ and a range of 22 miles +. See the fourwheeler section above for the surreys. I-Zip or E-Zip announced a recall in 2012 of some of its tricycle models. See the link for the full story. The delta trike is made by Acetrikes in China and distributed by Currie Technologies. The CPSC press release says "the rear axle can break causing a rear wheel to detach, posing a fall hazard to the rider." Kiffy is a French company with a line of urban trikes designed for shopping and other chores around town. Some models carry kids, other toolboxes or big boxes to hold groceries. Some fold, and all are designed to take up little space in an apartment. That means a narrow 22 inch width, normally not designed for flying around tight corners. But front wheels lean independently, so handling is similar to a bicycle. Ten seconds of folding with four movements makes the front half into a shopping cart, while you lock the back half outside. The front wheels fold together for compact storage. There is a canopy with clear plastic front for rainy days. It has hydraulic disks on the front wheels, and either a one or two-speed drive. Pricing is rumored to be about $2,000. Kiffy is entering the US market. KMX Karts is a UK company with tadpole trikes with two small front wheels and a larger rear wheel. Their base model is one of the least expensive we have seen despite the exchange rate. Their advertising emphasizes rugged components. Lightfoot Cycles of Conner, Montana, has several trikes plus four wheel models, from velomobiles and cargo machines to lighter weight touring versions, with lots of options. They also make models for people with leg or arm disabilities, very heavy riders, and other special needs or uses. Gil Linde has built three bump-em car trikes, inspired by the bumper car rides at amusement parks. They have low reclining seats surrounded by a low circular frame and heavy rubber bumpers. They are powered by a double-spoked unicycle wheel from Luke Shirk's amazing bike shop in Lancaster County PA and steered by the rear wheels using a lever on each side of the rider. With a combination of spin and reverse pedaling they can suddenly shift to backup mode in the wink of an eye. Steering is tricky at high speed, but playing bumper car in them is a kick. Gil thinks that commercializing them would be risky, so you can't buy one. Logo Trikes is an Australian company making high-end tadpole-style trikes and tandems. They have a trailer, too. Lone Star Tricycles is a Texas-based company with upright delta-style trikes. They have seven speeds and dual rear disc brakes. There is a basket behind the rider. There is an industrial model, and the Big Tex has Surly's impressively massive Pugsky 26" by 4" wheels. The URL is for a Web page that has the trikes for sale, after the one for Lone Star Tricycles disappeared in 2010. Main Street Pedicabs has a number of models of three-wheel pedicabs, adult trikes and cargo trikes. One is a pedal-electric hybrid, with a 500 watt electric motor for hill climbing and fast acceleration. It weighs 400 pounds including 120 pounds of battery. They run a fleet of pedicabs in Denver. Micah is a two wheels back trike with high-profile handlebars designed for special needs kids from 5 to 15. It has a handle extending out behind for parents to control the trike including a steering link, and adaptive seating arrangements. The frame is aluminum, with 16" wheels. It is available to dealers from Pacific Cycles of Taiwan. You can read about Pacific Cycles in the March 1, 2006 issue of Bicycle Retailer and Industry News. Mission Cycles and Components is a UK company with a wide range of trikes for special needs, including those with impaired balance. Their Mission Statement says their trikes are designed in the UK and manufactured in Taiwan. They have a trailer Trike that can be towed behind the parent bike, as well as child, adult, electric and folding trikes. Mobo by ASA Products are three wheel delta trike "cruisers" with fat wheels and direct drive cranks on the front wheel. They have rear wheel steering and a freewheel mechanism but no chain and no gears. The Pro model has a 20" front wheel, and the Triton has a 16" front wheel, setting the fixed gearing in a very low range. Frame length is adjustable to fit riders up to 6'3" on the adult Shift model. Other models are described as "great for ages 5 and up." Mupocar by Belik Creation of Texas has three and four wheel versions of their "muscle powered car." They are all powered by cranks directly attached to the front wheel and pedaled directly without gearing. Front wheels are listed as 20 or 28 inch, so that's the fixed gear. The rear wheels vary by model and do the steering. Nihola of the Netherlands has a tadpole cargo carrier with some astonishingly large cargo boxes in the front. Nuvo Trike has a folding delta trike with small rear wheels and a basket between them. The pedals are attached to the front wheel, but there is a freewheel mechanism that allows coasting and a single front wheel brake. Retail is $300. Optima Cycles is a Dutch company with a line of recumbents, two of which are tadpole trikes. Their Rhino ST has a curved boom frame of aluminum with rear suspension, laid back seat position and short turning radius. The Rider model is similar, but has a stainless steel frame. Organic Engines has a road trike, a tandem trike called the Troika, a delivery trike called the Sensible Utility Vehicle, and a pedicab. They also sell frame kits you can build up any way you want. They are located in Tallahassee, Florida. Pacific Cycles is a Taiwanese company producing a wide variety of trikes and four wheelers. They make unique vehicles, including many designed for handicapped riders. Some of their vehicles are available through Alternative Vehicles and a Canadian distributor, Belize Bikes. If you are searching for their products, avoid those of another company that uses exactly the same name except they have dropped the s on Cycles. Palmer Industries of Endicott, NY, has been in business since 1973. They have a line of trikes that include pedal, hand and electric power. Pedal-powered models have mostly 24 inch wheels and are designed for around town and utility use. The hand powered model has an optional foot pedal combination and optional variable speed electric power. Most models have large cargo baskets available for carrying groceries or others items. Palmer sells electric kits, too, and has their 12 volt motors available separately for experimenters. They stock parts for every product they have ever made. Pashley is an old-line British company with a full line of bikes of all kinds, including their PDQ3 recumbent. They have other tricycles as well. Their trikes are sold in the US market as well as the UK. Penninger Recumbents has three trikes called the Traveler, the Voyager and the T-31. Penninger is said to be division of HFR Precision Machining of Sugar Grove, Illinois. We can't find anything about their trikes on the HFR web page. But see the Versa Trike catalog for more about their models. PF Mobility has trikes for one and two people with and without electric motors. They are upright recumbent designs. This is a Danish company, and as you would guess from the name, they mostly sell to people who have trouble getting around. Performance Recumbent has tadpole trikes with 26" or 700C rear wheels and 20" front wheels. One model has the main frame tube in carbon, one model folds, some have rear suspension. Powabyke is a UK company with an electric-powered delta trike with a front power hub. It has a low step-through frame design and upright riding position. It has full gears for pedaling as well. The URL is not working as of June, 2010. Pterosail Trike Systems has bolt-on kits to add sails to recumbent tadpole trikes. Both solo and tandem recumbents can be fitted out with a mast and sails. The carbon fiber mast is 11 feet high, and the spar is aluminum. The sail sits out in front of the trike. Quadrabyke is a child's four, three or two wheeler. The small wheels can be set up in any of the three configurations. As a trike, it's a tadpole. Q-Int from the Netherlands makes tricycles for children and adults. Their Triker carving go-karts are delta trikes with the cranks out front driving the front wheel with a very short chain and freewheel. They steer by leaning. Wheels are small (12") keeping the trikes low. Other models have larger front wheels. Retail prices are in the $300 range. Ricksycle in Ontario has a delta trike with big wheels for two people side-by-side. It dismantles to stow in small places, and can be extended for more passengers. They have child kits, and can do custom arrangements for disabled passengers. Rifton Adaptive Tricycles make tricycles for kids with disabilities that are easily adjustable when the child grows. Roman Road Cycles is a Welsh company making tricycles and tricycle conversions, both solos and tandems. Their designs have 2 wheels at the front and one wheel at the back. They also supply components, including hub gears, hub brakes and custom wheels. Rowcumbent (Beanz Bikes) is a trike with two wheels in the rear that you power by conventional pedals and by rowing the handlebars. The company is in Southern California. RunAbout Cycles has recumbent trikes with electric assist that they call hybrid electric cycles, and can add electric assist to your trike. They have lithium ion batteries and a solar charger if you can afford them that let you run your transportation off grid. The company's shop is in Fort Collins, Colorado. They have a demo video up on YouTube. Scooterbug has seven-seater bikes where the riders face each other in a circle. They also distribute Mobilette in the US. Sherer USA has a tadpole recumbent with a push lever pedaling system. Instead of pedals on a crank, you push forward sequentially on two levers with your feet, and the levers move the crank down below through a cable and chain system. It still has gears on the rear. Similar lever push systems have been around for a long time on wedgies, but this is the first one we have seen on a recumbent trike. There is a TV news video so you can see it operate. I am sceptical of the inventor's claims for higher speeds, since I rode a wedgie with a similar system and it wasn't as fast for me as pedaling in little circles. Your mileage may vary. The company is in Iowa. In June of 2010 the URL was not working. Sidewinder Cycle has trikes with both front wheels driven and the single rear wheel pivoting to steer. They use dual inboard hydraulic disk brakes. There is an electric drive option too. The company is in Fillmore, California. Soloviov (Velomobiles) is a Russian company with a unique three wheel drive trike, and another that has a large cargo box under the frame. StreetStrider is an upright trike with two wheels in front that you propel by standing alternately on large pedal platforms with a fixed front bearing and the rear attached to regular cranks. The action is a lot like running. There is no saddle, so you are standing on the pedals. Some models have arm levers as well, and steer by leaning. The sturdiest is rated for a 450 pound load, and is featured on a sales video on YouTube that is worth a thousand words. EE Tad is a tadpole-style trike with steel frame, 24 speeds and 20 inch wheels. Traditional Trike has an upright position with two wheels in back. There are 26 inch, 20 inch and 12 inch models, all single speed. Atlas Trike and Atlas Cargo are upright trikes with cargo areas between the two rear wheels. Taga of the Netherlands makes a very nice looking three wheel tadpole design that works as a child carrier bicycle for one or two toddlers, or can be converted "in 20 seconds" to a stroller as well. It has 16 inch wheels, Shimano three speed hub and brakes for all three wheels (disks in the front). They offer a number of different options. The bike folds easily to go into a car trunk or for storage. Tasso is an Italian maker of three-wheeled pedicabs for passengers, cargo and even a camper. They have lots of photos of their products in nice Italian places. In June, 2010 the link was not working. Ti-Trikes A Connecticut manufacturer of interesting tadpole trikes, all with with titanium frames, high-end specs and priced from $3200. There are electric assist upgrades available, and a wooden bed cargo model. There is a hand-crank model as well: "The Tadpole design separates the steering system from the drive or propulsion system, so that power to the handcranks doesn�t affect steering and steering doesn�t affect power." And finally, a titanium tandem! Torker has one tricycle in their Adult Bikes category, revamped in 2011. It is an upright with two 20 inch rear wheels, single or three speed with coaster brake and front hand brake, wide saddle and optional rear fenders. Sold to dealers through Seattle Bike Supply. Trailmate makes the Joyrider and Jr. Joyrider, with small front wheels, steel frame, plastic bucket seats, rear basket and an "S" shaped crank. They are easily-mounted "walk-in" units. They also have Freedom Ryder adult trike models with gears, 20", 24" or 26" wheels, standard cranks and standard handlebars. They have recumbent trikes with 20" mag wheels, a chain-driven front wheel or rear wheel and low center of gravity. They also have an Eco-Trike with a very large cargo box between the rear wheels rated for 650 pound loads. And they have a folding delta trike called the Tri-Fold with 20 inch wheels. Transport Cycling has tricycle pedicabs. They also have a unique four wheeler with the driver in recumbent position. That should improve the forward view of the passengers. They also sell components and do custom work. Transformation Trike is an amazing cargo and people mover trike that converts from a tandem to a triplet, or can use a big cargo bed replacing the two rear saddle positions. There is also an aluminum frame trailer that can haul 350 pounds. Trek is a mainstream US bike brand that has two trikes in their "Pure" series of "bike trail" models. They have upright bars, baskets, chain guards, flat pedals and soft saddles. There is a one speed with coaster brake and a three speed. Both models have aluminum frames. Trek's products have a reputation for holding up well, and their dealer network provides good after-sales service. These are worth a look for retirees and other casual riders who want a simple trike to use on reasonably flat terrain. Trykit is a UK company producing classic British delta trikes with full size road wheels. Frames are fillet brazed steel, with a wide range of tubing available. The components are up to date, with optional aero wheels and disk brakes. In addition to trikes they sell frames and components, including a kit to convert your road bike to a trike. Tridynamic make tricycles for riders with disabilities that they say are designed to minimize tipovers. Trio Bike of the UK has a large tadpole trike that takes two kids in the front or cargo. It converts to a two wheeled bike or to a kids stroller. There is another version that does not convert. Tripendo had a trike that leans its whole structure into turns with both front wheels the way a two wheeler does. They claim extreme stability on fast turns. Electric assist option. Their links page had links to many other trike and velomobile manufacturers, but the site seems to have disappeared, so the link above is to a Google search. Tripod Bikes is a Dutch company with a tadpole trike that steers by leaning. It has rear suspension and 20 inch wheels with disk brakes on all three wheels. It comes in three models. Tri-Sled of Australia has a wide range of trikes including touring, racing, work trikes and pedicabs. They make a very low trike designed to have a fairing added for hpv use. In their accessories section they include a carrier that attaches to a standard tow-hitch ball, a servicing stand for the workshop and bags designed for their bikes. Their Interceptor Handcycle is for those with leg problems, permitting the rider to either kneel or put the legs out in front. The Handcycle is a delta design, while the others are tadpoles. The Tri-Sled Sorcerer is Australia�s first production velomobile. Truck Trike has a big industrial trike with a very large bed behind the rider that can carry 600 pounds. It has front wheel drive, a step-through frame, a handlebar display, LED running lights/turn signals/brake lights, motorcycle disk brakes, one or two rear wheels driven by electric motors, quick-swap battery, trailer hitch. There are many configuration options. True Bicycles is based in Michigan. They have trikes, including folders and step-throughs, with recumbent tadpoles and deltas in development. They have replacement parts, including solid axle-mounted Karasawa drum brakes, as well as electric kits. They also have special needs accessories, including heel-retention pedals. Tuantaigeer has at least two Chinese made trikes that are of the upright seating and two wheels in the rear variety. I rode their very interesting prototype solar powered trike at Interbike in 2006. It has a surrey type top that is formed by the 60 watt solar panel. The panel doesn't have enough juice to power the trike, but it recharges a battery. They expect it to retail in the $1500 to $2000 range. The US rep is Hui Chin Yang, Accurrent Intl Inc. in Gilbert, AZ. hjjang012@gmail.com 602-334-9773. Turf Trike is a unique pedal-powered golf cart. It has two wheels in front and an upright rider position. There is a removable carrier on the front for your golf bag with small wheels so you can roll your bag around. The chain is enclosed in a tartan cover. It has seven speeds and 24" x 4 1/4" turf tires. The front end folds to fit on a rear-mounted car bike rack. It was designed by Jason Deal and is made by Pacific Cycles for Cycle Cart, Inc.
Velomobilis of Lithuania has a tadpole trike with a very straight boom putting the pedals out front. 20 inch wheels in front, 26 in the back. Photos and comments on the Web site indicate they have plans for other Velomobiles, including four wheelers, but in mid-2007 the trike is their only current model. Versa Trike of St. Charles, Illinois, is produced by a ten year old non-profit known as Creative Mobility. They have one model intended for use by those who have trouble cycling for physical reasons that is 44 inches tall with rear wheels closer together than most trikes. They also have accessories like crank shorteners, Pedal Width Enhancers that put your pedals about an inch further out, a pedal that holds your foot in with a bungee cord and a Rigid Foot Plate for adapting almost any foot to a pedal. They have more on the Creative Mobility site. It has a catalog of adaptive bikes that includes trikes by Catrike, Freedom Concepts, Greenspeed, Trice Trike, Invacare, Hase, Penninger, Rifton, Quickie and others. That includes a tandem trike by Freedom Concepts where the driver steers from the rear and the front position rider just pedals and rides. Very Eco has unique custom trikes designed by Bill Blakie of Invercargill, New Zealand. His trike has one-handed steering via a single right or left lever, so it can be operated by a person who can use only one arm. This newsletter has a writeup on trying out his cycles in 2002. Why Walk Pedicab has a line of tricycle pedicabs. They range from simple pedaled machines with a two passenger seat behind the driver to electric assisted ones with full canopies. They have a cargo trike that can handle 1,000 pounds and a unique "Media Bike" that has a large screen behind the rider with two 3x4 foot scrolling poster ads in color with 12 volt backlighting and a stereo system. At $19,000 it may be the most expensive vehicle on this page, but Why Walk says it can be profitable if you can sell enough ads. Windcheetah/AVD has two tadpole trikes. Their 2007 Hypersport Series II has a unique aero front fairing, carbon fiber seat suspended on carbon fibre leaf springs, and a large rear wheel. They have been known for fast recumbents for more than 20 years. The Web site has downloadable manuals with some construction details. Part of the development cost of the Hypersport Series II was funded by an Innovation Grant from the UK Department of Trade and Industry. WizWheelz makes the TerraTrike, with two wheels forward and one wheel back. They have solo models in steel, aluminum and aluminum/carbon. For 2007 they also have a tandem with couplings to break down for transport. Zigo has a unique trike combined with a stroller/jogger. It has two 20" wheels on the front that are the stroller wheels when you dismount that section. There is an 8-speed internal gear rear hub. There is a spare wheel under the stroller to put on as the front wheel of the bike when you separate them, and two 8" caster wheels on the front of the stroller to make it a four wheel stroller. was the definitive recumbent tricycles page. When we found it we almost took the trikes off of ours. He had a photo of each trike, a very useful way of sorting through them. But we can't find it online any more. Before reading these, here is Murray Drew's site -- Manual Mobility -- for links to arm-powered vehicles and almost anything else you might want for muscle or electric powered mobility. Years after breaking his neck he is still working hard to get it all back. Action has two arm-powered Excelerator trikes, the L'il Excelerator with 20" wheels and the Top End Excelerator with 26" wheels. No pedals, arm power only! Seven speeds, high-back seat, custom bumper rack for your car. Action Top End, 4501 63rd Circle North, Pinellas Park, FL 33781, phone (800) 532-8677 or (813) 522-8677. Alternative Vehicles has a line of trikes and four wheelers mostly made by Pacific Cycles in Asia. Their hand-powered models are designed mostly for rehab and mobility. Angle Tech has a trike powered by either arms, legs, or both. Brike International has a Freedom Ryder hand-powered recumbent trike steered by leaning the body. Built for athletes and racing, it has a high tech look, particularly with the carbon fiber wheel option. Greenspeed makes a nice line of tricycles including a 54-speed hand-powered trike. If you can afford custom work, they have a custom shop. Intrepid Equipment has an arm-powered delta road trike with three 700c wheels, 21 speeds and dual front disk and rim brakes. There is an optional coupler to split the frame for transporting it in a car. They offer test rides and service at their San Diego location. Invacare has a racing arm-powered trike. It has a driven, pivoting front wheel, 27 speeds, 24 inch tires and optional carbon fiber wheels. Mobilis Corporation has at least three arm-powered trikes including the Armstrong, the Cruiser and the Lightning Bolt. No pedals, arm power only! Handled by Rideable Bike Replicas, 2329 Eagle St., Alameda, CA 94501, phone (510) 521-7145. Drachman's page on the Irish Mail and other velocipedes. There are photos and links. A wood kit to build one from Rockler. Mother Earth News has plans for building one as well. Space Bike makes a very small four wheeled rowing bike for toddlers and kids 3 to 12 years old. It is steered with the feet. Bright colors, including the wheels. There is a Youtube video on it. Ti-Trikes in the trikes section above has a hand-powered trike. Tri-Sled in the trikes section above has a hand-powered trike. Atomic Zombie sells plans for a number of tricycles, including adult deltas and tadpoles, novelty, hand-powered and stunt trikes. Bicycle Lane Industries has plans for a cargo trike based on a grocery cart. The description makes the trike seem pretty lame, but the writeup will help you to avoid the problems they uncovered if you want to design a cargo trike. Hell-bent Cycle Works has designs for Thunderbolt Mk II 26 tadpole-style recumbent trikes with an aluminum frame. They sell trike plans and components when ready, and have some examples of their plans on the Web. Be sure to check out the About page for background on how the company has developed and the What's New page for recent changes. The plans we have seen appear to be very well done, with photos, drawings and dimensional drawings along with discussion of frame materials and a lot of other info. We have not, however, built one, so we don't know how they work out. Hoard's Bike Cart has plans on the Web for making a trike that has a garden cart with two wheels on the front. With photos of the two they have in use on a ranch. The builder says "You can easily pedal up to 200 pounds of anything that isn't kicking like crazy to its destination. They are great for bringing in the produce, moving sacks of grain, bales of hay, sick calves, manure, etc." Larry Bowden has plans up for tricycles. They are free for personal use but he asks you to make a small donation to Princess Margaret Hospital Foundation. Vintage Projects has plans for building very old looking designs for a sidecar and a chariot-style trailer. There are a number of car-like fully enclosed tricycles available now, mostly in Germany and the Netherlands. Some are listed above. AeroRider is a Dutch company with a bullet shaped vehicle on three wheels. There are a least two models. The larger one weighs 150 lbs, and has electric assist that can do 28mph/45kph over a 19 to 56 mile (30 to 90km) range. It has vents and fans for cooling. The smaller model can be run without the upper clear plastic fairing for warm days. Go One is a German company with a bullet-shaped fully-enclosed aerodynamic recumbent tadpole trike with a carbon fiber monocoque chassis that keeps the weight to 60 pounds. It is a fully-equipped human-powered vehicle with lights and turn signals. There is a 350 watt electric assist motor available. The US link is above, but there is a German site as well. Prices run $10,000 to $13,000. Greenspeed makes a nice line of tricycles including a velocar called the Glyde. See Tri-Sled in the trikes section above for another Australian velomobile. Fietser.be is a Belgian company with their own WAW velomobile. They also act as a dealer for ICE Trikes and TerraTrike. Leitra is a Danish company who built their first Velomobile in 1980. It is a three-wheeled design with a unique fairing with cutaway sides that permits arm signals (insisted on by Danish authorities when they approved its use in 1982). Lightfoot Cycles of Conner, Montana, has a fully-enclosed velocar, as well as head-out models scheduled for mid-2012. Other bikes in their line can be fitted with all-weather protection. Flevobike alleweder is a German velomobile with three wheels and a full fairing. The company has unfaired trikes as well. Velomobiel is a Dutch company with several velomobile models. Some of their designs are now produced in Canada and available through Blue Velo in Toronto. Fietsen has photos and reviews of trikes, bents and velomobiles. Thanks to Dan Beckwith, we are now aware of at least one shop in the US that rents trikes and fourwheelers, or perhaps used to. The Pepperell Bike Shop in Pepperell, Massachusetts, had various models on their Web page, but we can't find mention of rentals any more. Another East Coast dealer who normally has many trikes in stock for test rides and perhaps for rentals is Mount Airy Bicycles in Mount Airy Maryland. Proprietor Larry Black has been an alternative bicycle addict for many years, and his medium-sized shop is crammed with very interesting machines, all available for test rides in the Maryland countryside. The Autocanoe is a unique amphibian, with a canoe body with three wheels, two of which function as paddlewheels when the canoe enters the water. There is a high mortality rate in four and three wheel bicycle companies. Or perhaps just a high rate of Web site changes. We can't find these any more so if you need to contact one we suggest a Google search. Quetzal Cycle is a Canadian manufacturer of recumbents with a trike model that looks utilitarian with five speeds and a large rear basket. Some of their models have an "overdrive" unit to increase the gear ratio, a feature they explain on their technology page with a formula for calculating the distance traveled per crank revolution. On their 2003 catalog page they have a bike rack that fits on the back of a minivan or suv putting the rear wheel close to the rear window and the front wheel up over the roof of the car. In a brochure we picked up at Interbike in 2002 they also have a trike adaptor that puts two wheels on the back of its standard recumbent models, but we did not find either the rack or trike adaptor listed for sale on their Web page in September of 2003. In late 2004 their page ceased to respond. Let us know if they come back. Ultimate-Quadracycle has the CosyCycle line of trikes and four wheel bikes. Located in Canada, they are the North American rep for CosyCycles. (We have lost track of the former international rep.) Their four wheelers carry one to four riders. On two-seater four wheelers, each rider drives one of the rear wheels, and can select their gears independently. They have an interesting work trike called the CC-Work Buddy that can carry up to 600 pounds. Quikke was originally a conversion kit to add two wheels in front to a two wheeler or alpha trike. The kit is no longer available from LoMac Products, who have sold out all remaining stock of parts. They are now producing for other brands. Go-Kid Quadcoasters were not really bicycles, but they have four medium sized wheels spaced widely enough to look like a bike. Some are propelled by kicking out the back and some called Equads come with electric motors useful for handicapped users. They are located in Houston. The URL redirects to an advertising site now. Generally you can find more and fresher links with a Google search for "four wheel bicycle" the same way most people find this page. Our first search for four wheel bicycle turned up 66,500 possible pages. With quotes before and after the phrase (the link above), it found only 295 pages. As of March, 2003, the number had fallen to 272. You can also search for variations like four wheel bike, and get many more pages. Using the number 4 instead of the word did not work as well for us. You might try another search engine, but we don't since Google works so well. And don't overlook their Images option up at the top if you know what the bike you are looking for should look like. If you find a link on this page that does not work, you can use Google to search for the company name to find out if they have a new site. Then let us know where you found it! In 1995 I put up a page to vent my frustrations with a four wheeled bike called the Forerunner that I had bought in 1994. People emailed me looking for four wheeled bikes and tricycles, and others telling me they make them. (And one who asked to be taken off our page.) I have also been checking out the companies each year at the Interbike trade show, and the list has grown. I still ride my Forerunner, and don't know anything at all about most of the companies listed above or their products, so can't recommend any of them or vouch for their integrity. In at least one case a customer has emailed us his account of a dispute with one of the companies. You should use normal business caution dealing with them, of course, so you are on your own! In many cases the bikes are sold through local bike shops. Our most active local seller of non-traditional pedal powered vehicles is Mount Airy Bicycles in Mount Airy, Maryland. They have amazing things in stock, and I recommend them highly. I understand that Utah Trikes has over 500 tricycles in stock. There are lots of non-specialized local dealers who have fewer choices but some good bikes. I do not accept anything from any manufacturer or retailer except test rides, so this page is not influenced by commercial considerations. It runs on the Bicycle Helmet Safety Institute site, where I work full time as a volunteer, and I contribute enough work to BHSI to offset the minimal resources the page uses. There are no ads on this page, and no commercial angles here. If you know of other four wheel bike manufacturers or adult tricycle makers I would be delighted to hear from you. Please send me an email. Something on this page was updated on: May 29, 2018.